In the central part of the passenger terminal, upon completion of flight registration with selected airline awaits you access control . At this counter you need to show your boarding pass and register your hand baggage. Our staff will in accordance with the regulations of the selected airline perform control of the allowed size and number of hand baggage pieces (link to the menu baggage - hand luggage). In the case that weight and / or dimensions of luggage are not in accordance with the selected airline regulations, our staff will direct you to the registration desk where you can register the baggage as checked. The access control passage is open 2 hours before the scheduled departure time of the selected airline aircraft . To speed up your next step in passing through security control, you are able at the access control, through the video on the display above the counter, get familiar with the preparation for counter-sabotage control, also on boards by the counter are displayed, the basic guidelines about prohibited items and hazardous substances that are not permitted to enter the passenger cabin of the aircraft, as well as restrictions on liquids in hand luggage. To shorten the retention time during security checks it is necessary to properly prepare for the implementation of counter-diversion control, on one of the two desks. On the preparation site our staff will wait for you and inform In short what things you need to take off or remove from the pocket and / or from hand luggage (mobile phone, laptop computer, other electronic devices, wallet, watch, belt, jacket, coat, jacket, keys, or other metal objects, etc.) and place in a dedicated plastic containers. other prohibited items and hazardous substances defined by current regulations in the field of air traffic safety (for more details link List prohibited objects and dangerous substances). If you intend to carry items in hand baggage that are in liquid form, then their individual packaging can not be greater than 100 mL. 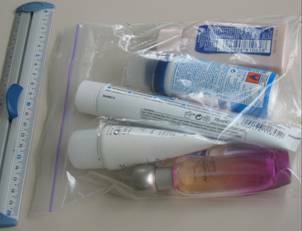 All items should be packed together in transparent bags with a groove (zip bags), and the maximum volume of all items in a bag may not be larger than 1 liter per passenger. all other items with similar characteristics. If security control finds certain items that are prohibited in the passenger cabin of the aircraft, and you would like to take the flight with chosen airline, you have to dispose the items in dedicated box next to the desk for counter-sabotage control. Upon completion of the security control carefully pack up and inspect the plastic containers in which your items were disposed of. For more information regarding prohibited items and dangerous goods, contact the selected airline. After passing the access and security controls , you arrive to two the customs control desks , conducted by the Customs offices staff at the Podgorica airport . can be found in the brochure Information for travelers (link to open the pdf. document). Upon completion of passport control and takeover of hand baggage from conveyor belts, before leaving the incoming part of the passenger terminal, you arrive to the red and green custom control channel . If you have goods to declare with you or in hand or checked baggage you have to report on the border crossing to enter the customs territory of Montenegro, opt for red or otherwise passing through the green channel. You can find the Information in brochures for travelers (link to open the pdf. document) and Guide for entry of goods into the customs territory of Montenegro (link to open the pdf. document). Customs regulations of Montenegro prohibit the transfer of protected plant and animal species , the entry of weapons and ammunition and transfer of animals (other than pets). More information regarding the customs regulations that apply to passengers who are going to or coming from abroad, can be found on the website of the Customs Administration of Montenegro:www.upravacarina.me , under travel information. Passport control for departuring passengers is located, after Security desk and customs control counters, and before entering the waiting area for departing flights. Passport control at Podgorica airport is conducted by the Border Police Station officials at Podgorica airport. Before you approach passport control at one of the four open counters, prepare your personal and travel documents, as well as a boarding coupon for the selected airline aircraft. Documents that will be required to travel to the planned destination depend on the way of cooperation of the state, whose own passport and state in which you are traveling. In case you on your journey presijedate from one to the other aircraft in advance that you need and transit visa for airports through which tranizitirate. After landing at the airport in Podgorica, after disembarking from the aircraft and entering the incoming part of the passenger terminal, in case you are not a passenger in the transfer, experiencing six counters for passport control. Before you approach any of the open counters, prepare your travel documents to control. More information on the issue of travel documents and visa regime for citizens of Montenegro and foreign citizens can be found on the website of the Ministry of Foreign Affairs and European Integration of Montenegro: www.mvpei.gov.me , under the rubric of Consular Affairs.